The Obelisk of Incineration is an Arcane weapon. This magical obelisk fuses super concentrated carbon material with supernatural heat forces to produce an unmeasurably hot flame. The resulting thermal explosion quickly seeks out the nearest object with somewhat limited accuracy. A Nose peg is suggested when using this hunting gear. The Obelisk of Incineration is not sold by any Trapsmith. It can only be crafted given the proper ingredients. Obelisk of Slumber – Source of Obelisk Parts for crafting. Arcane Capturing Rod Of Never Yielding Mystery – Requires Obelisk Parts for crafting. Smashing this weapon with the Hunter's Hammer yields the Obelisk Parts. 10 February 2009: The Obelisk of Incineration was introduced along with the Hunter's Hammer. 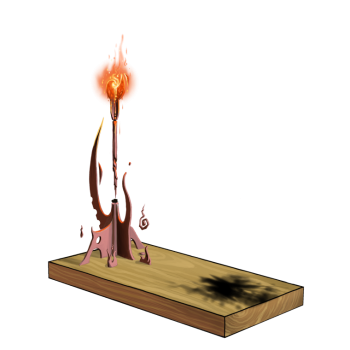 The Obelisk of Incineration was the first crafted Arcane type weapon to be released.